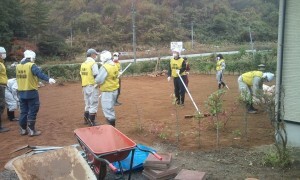 The decontamination work in Fukushima Prefecture poses difficult problems politically, socially and technologically. It has already determined that the decontamination of the area over 20mSv in annual cumulative dose of airborne radiation would be the responsibility of the government and the area below the level would be carried out by the municipal administration. The main issue is how to manage the low (high) concentrated waste (soil, grass, etc.) after the decontamination work. There is little progress on the establishment of “temporary storage spaces” of the waste in each province, because it is necessary to obtain the consent of the local people regardless it would be state-owned land or private property. In part of Fukushima city, the municipal government suggests to leave wastes on the corner of the houses, but it might create the trouble with their neighbors. The amount of radioactive materials diffused into the environment won’t change in any case.